Oh Carol. So hard to lose a wonderful friend. I'm so sorry. 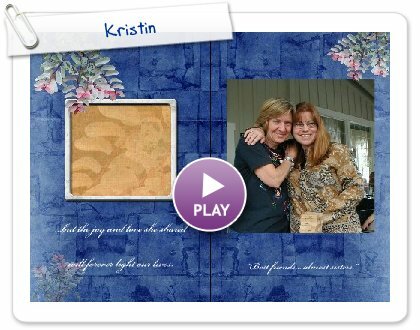 What a beautiful tribute for your friend Kristin. It puts tears in my eyes. I am so sorry for your loss. I'm very sorry for your loss. I lost a good friend to cancer last year, and this past Christmas I lost a friend to domestic violence. Losing a friend is so painful. My thoughts are with you. What a beautiful tribute to your sister-friend, Carol. I'm so sorry for your loss. Carol, I am so sorry for your loss. She was such a wonderful sister/friend. You were lucky to have had each other. What a beautiful and creative tribute.